"A Dark Knight: A Day In The Narrows"
Never Mind The Bullocks: I think it’s time to retire this section of the discussion post, at least until Gotham plays out this “downfall of Bullock” storyline, which is one I’m really enjoying even if I miss classic, buddy-cop Bullock. Last week I wasn’t too thrilled by the newly introduced Professor Pyg—which I typed out as “Professor Pig,” thereby revealing my lack of superhero/comic knowledge—but this week’s episode changes things a bit. 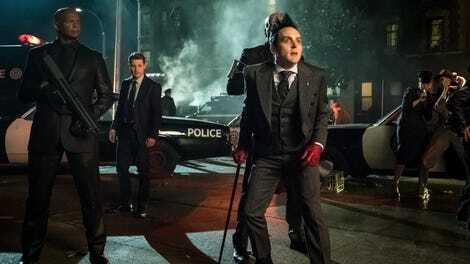 Rather than focus stricly on the villain as a serial killer, Gotham uses the character to provide insight into some more compelling storylines, namely Penguin’s continued alignment with the GCPD, and the building tension between Gordon and Bullock. I love the early gag where Gordon chastises a bunch of delivery guys for not questioning the bloody boxes they’ve been instructed to drop off at the GCPD headquarters. The tension between Gordon and Bullock reaches new heights when the latter agrees to let Penguin, and his new bodyguard Headhunter, lead the charge in the search for Professor Pyg. Gordon was heartbroken when he found out his former partner was taking money from the crime boss, but this is a new low. Gotham has done a good job of slowly building to this episode, which feels like a climax of sorts when Bullock ends up botching an operation after Gordon warns him to call it off. Every episode has steadily contributed to a better understanding of how Pax Penguina is affecting the city, the GCPD, and the relationship between Gordon and Bullock. It’s clear, effective storytelling. Building that steady tension continues when Gordon witnesses Penguin’s tactics for finding out where Professor Pyg, and the three cops he’s kidnapped, is hiding out. His team goes from apartment to apartment beating up residents in the Narrows, all with Bullock’s seal of approval. The tactic eventually works after a tense standoff between Gordon and the Headhunter, but not without some moral compromise. It looks like we’re about to get an angrier, more brooding Bruce Wayne. He’s struggling with the fact that he killed Ra’s, and that means he has no choice but to buy a club and party with some snooty kids he used to know from school. I know it’s supposed to be a sad look into his broken psyche, but watching David Mazouz put on sunglasses in a dark club and pop a bunch of bottles is just too much fun. It’s a small section of this episode, but how can you not love Selina, Tabitha, and Barbara teaming up to take down a biker gang? Gotham clearly knows what it has by putting those three characters together, as it gives them the badass “walk in a really cool way toward the camera” shot to close out their big scene. “The ‘y’ is because it’s short for Pygmalion.” Why didn’t you tell me this last week, Professor Pyg? The whole episode builds to quite the climax, with Bullock ignoring Gordon’s advice, teaming up with Penguin, and walking right into a trap that leads to the deaths of quite a few cops, and Harvey accidentally shooting one himself. Gordon saves them all and becomes the hero, inspiring at least some of his fellow cops to turn against the licensing system. The question is, can Bullock be saved? He’s drinking on the job and clearly struggling with the decisions he’s made. As Gordon becomes the hero, Bullock becomes the cop who screwed everything up. 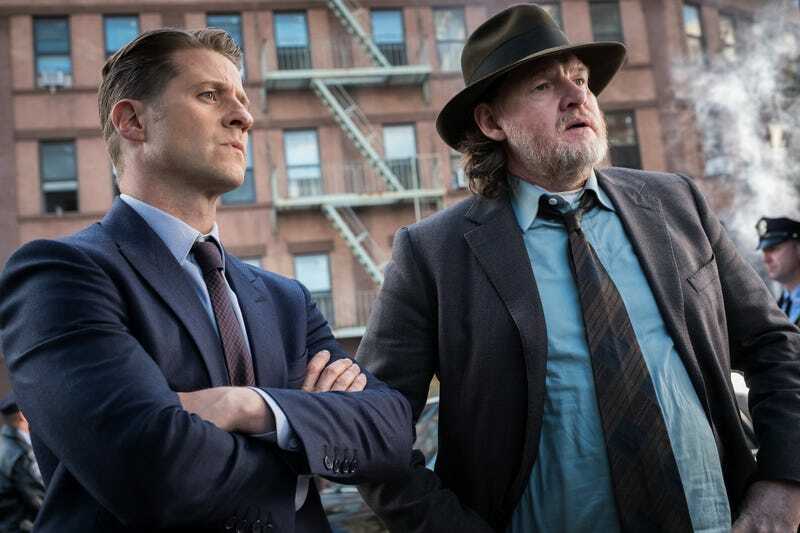 I was originally worried about Gotham driving a wedge between Bullock and Gordon, but so far it’s been an excellent bit of storytelling, and a much more effective exploration of shifting morality in a corrupt society than anything the show’s done with Gordon in the past.